Today we want to talk about a subject many users forget about when it comes to ESD protection: periodic verification. Whilst many people understand the basic concepts of ESD and as a result insist on a properly equipped ESD Protected Area (EPA), they then forget all about it. They use the same products day-in, day-out, year after year, without knowing if their products are actually still working properly. Each component in an ESD protected area (EPA) plays a vital part in the fight against electrostatic discharge (ESD). If just one component is not performing correctly, you could damage your ESD sensitive devices potentially costing your company money. The problem with many ESD protection products (think wrist straps!) is that you can’t always see the damage. Just by looking at a coiled cord that has no visibly damage to the insulation you would not know if the conductor on the inside is damaged. That’s where periodic verification comes into play. For periodic checks of installed products as part of IEC 61340-5-1 Edition 1 2007-08 clause 5.2.3 Compliance verification plan. It’s #3 we will be focusing on in this 2-part series. The purpose of ESD bench matting is to ensure that when charged conductors (conductive or dissipative) are placed upon the surface, a controlled discharge occurs and electrostatic charges are removed to ground. However, this only occurs if the ESD work surface is actually connected to ground. If the matting is out-of-spec, not grounded at all, the stud on the mat has become loose or the ground cord has become disconnected, charges cannot be removed. Many companies use a daily checklist, which includes the operator having to verify that ground cords are firmly connected. Remember to regularly clean your bench matting to maintain proper electrical function (e.g. Reztore Surface and Mat Cleaner). Do not use cleaners with silicone as silicone build-up will create an insulative film on the surface. Surface resistance testers can be used to perform these tests in accordance with EN 61340-5-1 Electrostatics and its test method IEC 61340-2-3; if these measurements are within acceptable ranges, the worksurface matting and its connections are good. As discharges from people handling ESD sensitive devices cause significant ESD damage, the wrist strap is considered the first line of ESD control. Before handling ESD sensitive items, you should visually inspect the wrist strap to see if there are any breakages etc. The wrist strap should then be tested while worn using a wrist strap tester. This ensures all three components are checked: the wrist band, the ground cord (including resistor) and the interface with the wearer’s skin. Records of each test should be kept. Wiggling the resistor strain relief portion of the coil cord during the test will help identify failures sooner. Analysis and corrective action should take place when a wrist strap tester indicates a failure. It is recommended that wrist straps are checked at least daily. An even better solution to daily wrist strap checks is the use of continuous monitors. They will alarm if the person or work surface is not properly grounded. A note on worksurface matting and wrist straps: if you are using earth bonding points, earth bonding bars etc. to ground the operator and/or bench matting, remember to inspect and test those regularly as well (every 6 months for example). Keep your eyes peeled for our follow-up post. Protektive Pak® Material is made from static dissipative impregnated corrugated material with a buried shielding layer – it provides static shielding to protect ESD sensitive items from ElectroStatic charges, and ElectroStatic Discharges [ESD]. So now you’re probably wondering what’s different about this type of material – loads of companies out there offer similar products, right? That’s true – BUT what makes Protektive Pak® Material so unique is that its ESD properties are manufactured into the liners of the material itself. Many other materials have a coating or paint applied that gives them their ESD properties. This in itself is not a problem. However, it becomes an issue if the outer layer of your ESD container is damaged. Have you ever removed tape from your ESD container or accidently pierced the surface with a sharp object? If you have, chances are you’ve found the black coat give way to a lighter brown material. That’s your ESD properties gone potentially damaging your ESD sensitive devices inside the ESD container. This will not happen with Protektive Pak® Material – even if the outer layer is damaged, your ESD sensitive items are still protected. Not convinced? Check-out this video. Protektive Pak® impregnated corrugated material has a buried shielding layer. Protektive Pak® impregnated corrugated material equals or exceeds the discharge shielding capabilities of a coated box. Protektive Pak® impregnated corrugated material has discharge shielding capabilities equal to a metal-out shielding bag. Protektive Pak® impregnated corrugated material meets the ANSI/ESD S541 recommendation, avoiding rapid discharge when contacting ESD sensitive items – coated boxes DO NOT. Manufactured by one paper mill with computerized control, resulting in consistent high quality. Manufactured without computer controls and applied at various geographical locations, resulting in quality variations. Carbon is added during the paper making process. The paper is a 6-layer process. The top surface layer is static dissipative, measuring 107 to 109 ohms. The conductive layer is in the 5th layer from the surface measuring <104 ohms. Material is coated or printed with carbon loaded black ink which is then coated with a clear sealer to help coating stay on. Shielding layer is very close to surface and high carbon content can bleed through. Result is very poor and inconsistent static dissipative effectiveness. Manufactured from 100% recycled paper with consistently low sulphur content. Manufactured from either recycled or virgin paper or a combination of both. sulphur content may be low or high which can cause corrosion to leads and circuits. 1,000 Times Thicker: Abrasion tests have shown no loss in particles at 100 cycles, only 1% loss for 200 cycles and 60% loss for 500 cycles. Tests have shown a 50% loss in particles in only 10 cycles and a 100% loss in 100 cycles. Burying the conductive layer under a dissipative surface reduces the potential for a rapid discharge when contacted by a charged device. A very conductive surface that may pose a charged device model (CDM) ESD danger to components stored in open bin boxes, in-plant handlers, shippers, totes, nesting trays, etc. Shielding effectiveness is equal to or greater than coated conductive materials. Some coated products shield poorly due to inconsistent application procedures by some manufacturers. More durable structure, 1,000 times thicker, which consistently shields your product from ESD, is also safer and better for the environment. Simple structure which can lack consistency of ESD shielding, durability and safety. All microscopic photos are approximately the same scale. A PDF version of the above table is available here. Wrist straps are considered the first line of ESD Control. They are used to link people to ground which ensures that that the operator is kept at the same potential as surfaces, objects and ESD sensitive devices. Wrist straps need to be visually inspected and checked (while worn) on a daily basis – BEFORE handling any ESD sensitive item. This will alert the operator if their wrist strap has developed a fault and as a result does not ground them any longer. In today’s post we will highlight 4 benefits of continuous monitoring which may help you decide to move away from daily wrist strap checks. But first a little reminder of what continuous monitors actually are: Continuous monitors come in different styles and sizes but are intended to be kept on your workstation. Some units just ‘sit’ on your bench; others are attached to your working surface matting; some can even be attached underneath the workbench so they don’t take away valuable workspace. Operators connect their wrist strap to the unit to allow for real-time continuous monitoring. If the wrist strap fails, the unit will alarm. Many continuous monitors also feature a parking stud providing a means for the operator to disconnect when leaving their workstation. Single-wire continuous monitors allow the use of any standard, single-wire wrist strap and coil cord. The monitor / wrist strap system life-cycle costs are significantly lower than dual-wire systems. While they would not be suitable for the most critical applications, single-wire continuous monitors are an economical way to monitor both the operator’s wrist strap and/or workstation surface. Dual-wire constant monitors provide true continuous monitoring of wrist strap functionality and operator safety according to accepted industry standards. Dual-wire continuous monitors provide redundancy because even if one dual-wire wrist strap conductor is severed, the operator still has a reliable path-to-ground with the other conductor. Imagine this scenario: you come to work in the morning, you test your wrist strap, it passes and you start work on your ESD sensitive devices. 3 hours later, when you come back from your tea break, you test your wrist strap again and it fails. What to do? You don’t know if the wrist strap only just failed or if it failed right after your first test in the morning. How do you know if the devices you worked on all morning have been damaged? You don’t – after all, latent defects are not visible and failures may only occur at a later time. Using continuous monitoring while working on those ESD sensitive devices will alert the operator as soon as their wrist strap fails. The faulty wrist strap can be replaced with a new model from stock and everyone is happy – no ESD sensitive devices damaged and no unhappy customers. Continuous monitors provide operators with instant feedback on the status and functionality of their wrist strap. The instant an operator’s wrist strap or cord fails, the monitor will issue audible and visual (LEDs) alarms alerting the user and supervisor of the problem. Full time continuous monitoring is superior to periodic or pulsed testing, and can save a significant amount of money in testing costs and rejected product. Periodic testing only detects wrist strap failures after ESD susceptible products have been manufactured. The costs of dealing with the resulting catastrophic failures or latent defects can be considerable. “A properly grounded wrist strap will keep a person’s body voltage to approximately + 10 V. The main advantage to a constant [or continuous] monitor is the immediate indication that the employee receives if the wrist strap falls open. With an unmonitored system, the employee will not be aware of a wrist strap failure until the start of the next shift. This has reliability benefits for an ESD program as it might help reduce or eliminate ESD damage.” [CLC/TR 61340-5-2:2008 User guide Annex B.1.3 Constant monitors]. When the monitor is connected to an ESD Mat working surface, the amount of current that flows is a function of the total resistance between the monitor and through the working surface to ground. When the resistance of the working surface is below a pre-set threshold*, the monitor will indicate good. Conversely, if the resistance level is high when compared to the monitor’s reference*, the unit will alarm. This is an integrating resistance measuring circuit, therefore it is relatively insensitive to externally induced electromagnetic fields. “For units that also monitor the connection of a worksurface to protective earth, it is also possible to reduce or eliminate the checking of the worksurface as part of the periodic audit of the process.” [CLC/TR 61340-5-2:2008 User guide Annex B.1.3 Constant monitors]. *The resistance threshold limits can vary between brands and models (and can sometimes also be adjusted by the user) so make sure you do your homework before committing to a particular unit and check the limit meets your individual requirements. Unlike wrist strap testers, continuous monitors detect split-second failures when the wrist strap is still in the “intermittent” stage. This is prior to a permanent “open” which could result in damage to ESD sensitive components. Many customers are eliminating periodic touch testing of wrist straps and are utilising continuous monitoring to better ensure that their products were manufactured in an ESD protected environment. Continuous monitors eliminate the need for users to test wrist straps and log the results; by their function, these monitors satisfy the EN 61340-5-1 test logging requirements. “There are also other process benefits from using constant monitors such as the elimination of the need to maintain daily test logs and a reduction in the time for employees to make the daily test.” [CLC/TR 61340-5-2:2008 User guide Annex B.1.3 Constant monitors]. Don’t have to waste time queuing at a wrist strap test station before each shift. Don’t have to remember to complete their daily test logs. It’s also harder to ‘cheat’ with continuous monitors. We’re not saying, your employees would do naughty things like that but we’ve seen it all before: operators ‘pretending’ to perform a wrist strap check, operators failing a wrist strap test and still recording a pass etc. There are always options to bypass a system, but it’s definitely harder when continuous monitors are used. So should you now run-out and equip all your users with continuous monitors? As with most things in life, the answer is not that simple: it depends! If your company manufactures products containing ESD sensitive items, you need to ask yourself “how important is the reliability of our products”? Sooner or later a wrist strap is going to fail. If your products are of such high value that you need to be 100% sure your operators are grounded at all times, then you should consider a continuous monitoring system. So you’ve identified ESD sensitive items in your factory and you realise that you need to implement ESD Control measures. But where do you start? There is so much information out there and it can be completely overwhelming. Don’t panic – today’s blog post will provide you with a step-by-step guide on how to set-up a suitable ESD Control Plan. A copy of EN 61340-5-1:2007 can be purchased from British Standards: “BS EN 61340-5-1:2007 applies to activities that: manufacture, process, assemble, install, package, label, service, test, inspect, transport or otherwise handle electrical or electronic parts, assemblies and equipment susceptible to damage by electrostatic discharges greater than or equal to 100 V human body model (HBM). BS EN 61340-5-1 provides the requirements for an ESD control program. The user should refer to IEC 61340-5-2 for guidance on the implementation of this standard. Wrist straps must be worn if the operator is seated. A flooring / footwear system is an alternative for standing or mobile workers. In some cases, both (wrist strap and foot grounders) will be used. ESD Control Plans must evolve to keep pace with costs, device sensitivities and the way devices are manufactured. Define the departments and areas to be considered part of the ESD Protected Area. Consider if customers and/or subcontractors should be included. Implement access control devices, signs and floor marking tape to identify and control access to the ESD Protected Area. Elements that should be considered include: working surfaces, flooring, seating, ionisation, shelving, mobile equipment (carts) and garments. 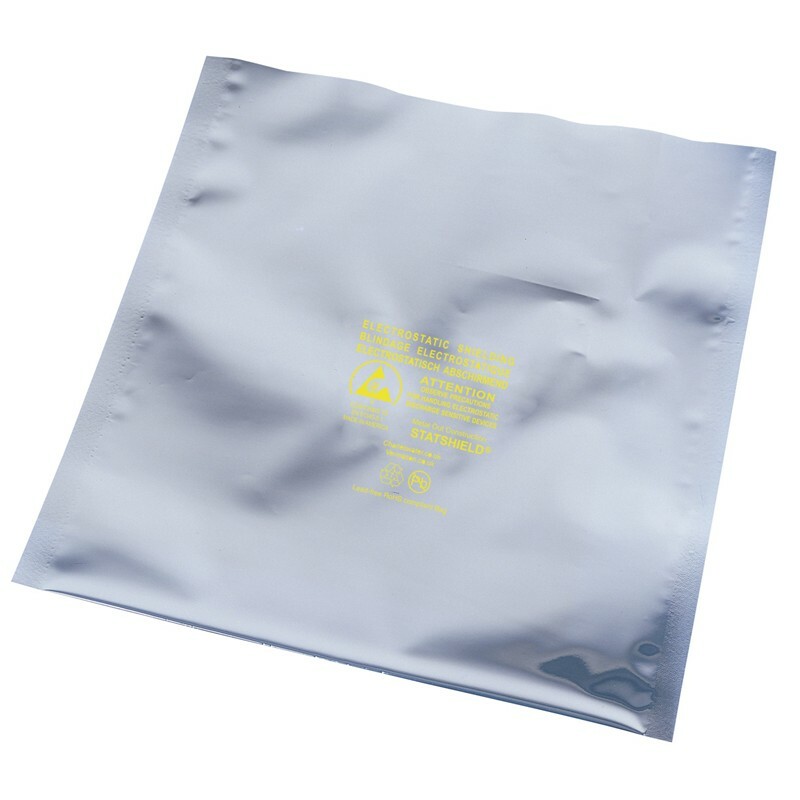 When moving ESD susceptible devices outside an ESD protected area, it is necessary for the product to be packaged in an enclosed ESD Shielding Packaging. From EN 61340-5-1 Edition 1.0 2007-08 clause 5.2.1: “The Organization shall prepare an ESD Control Program Plan that addresses each of the requirements of the Program. Those requirements include: …marking”. Developing and implementing an ESD control programme is only the first step. The second step is to continually review, verify, analyse, evaluate and improve your ESD programme. Regular programme compliance verification and auditing is a key part of a successful ESD control programme. Compliance Verification Plan: includes periodic checking of EPA ESD control items and calibration of test equipment per manufacturer and industry recommendations. Training Plan: an ESD Programme is only as good as the use of the products by personnel. When personnel understand the concepts of ESD, the importance to the company of the ESD control programme and the proper use of ESD products, they will implement a better ESD control programme improving quality, productivity and reliability. In the last post we talked about why insulators in your ESD Protected Area (EPA) can cause problems and started creating a list of the most commonly used insulative items that you should replace with ESD safe alternatives. Missed the post? Catch-up here. If you work with solder irons or perform various cleaning tasks at your ESD workstation, you will likely be using water or some sort of cleaning agent. Where do you store those liquids? Plastic cups? If so, that’s a BIG no-no and if you’re truly committed to your ESD Control Programme, you should be switching to ESD protective bottles immediately. ESD dispensing bottles come in all sorts of sizes, colours and with different pumps or spouts. Whatever type you need for your application, you will generally be able to find an ESD alternative. ESD dispensing bottles are dissipative and high-quality types will have no migratory additives which reduces the chance for contamination from the bottle. Probes are ideal for opening plastic cases such as MP3 players, cell phones, laptops, etc. and for popping out batteries. They are also used for holding, probing, and manipulating wires and components during assembly and soldering. ESD safe versions are made of nylon, wood or stainless steel. The hygroscopic (readily accepts moisture) properties of Nylon will make this tool suitable for use around ESD sensitive components after a few minutes of handling the tool with bare hands. If used with gloves in a clean environment the tools must be dipped in a topical antistatic solution before use in sensitive areas. Topical treatment should be repeated at six month intervals. Without exposure to moisture or antistatic treatment, Nylon is in the insulative resistance range and charges will not be removed to ground. Wood is considered a safe material for use in ESD sensitive areas. It is hygroscopic and has a low propensity for triboelectric charge generation under most conditions. Any charge on a stainless steel probe can be grounded when it is placed on an ESD protected work surface. ESD safe waste bins are generally conductive and are useful in ESD Protected Areas where waste accumulates and cannot be conveniently removed except in bulk. By placing them on a grounded floor, electrostatic charges are removed to ground. They do not require separate grounding when placed on a grounded surface. If you’re currently using standard bin liners, replace those with non-tribocharging ESD versions. Even at low humidity they do not become charged with static electricity and are designed for use in ESD protected areas where electrostatic sensitive devices are present. And there you have it – a list of of tools and accessories that you should be replacing with ESD protective alternatives. Can you think of any others? Let us know in the comments! So you finally have your ESD Protected Area (EPA) in place – you’ve invested in ESD working surface & floor matting, provided wrist straps & foot grounders for your workers and you control access to your EPA. But still: you are experiencing a large number of failures when inspecting your components after the production stage. The reason may be simpler than you think. Read on to find out more. Materials that easily transfer electrons (or charge) are called conductors and are said to have “free” electrons. Grounding works effectively to remove electrostatic charges from conductors to ground. Materials that do not easily transfer electrons are called insulators or non-conductors. An insulator will hold the charge and cannot be grounded; therefore, the charge cannot dissipate in a controlled way. This could lead to static damage of nearby sensitive components as there can be a rapid, spontaneous transfer of electrostatic charge. Paper is everywhere in the workplace and an ESD Protected Area is no exception. The problem with regular paper is that it is insulative but tends to be low charging because it is hygroscopic (readily absorbs moisture). The primary concern with paper is placing ESD sensitive items on the paper interfering with the path-to-ground of the grounded ESD mat. Best practice is to use dissipative paper or have regular insulative paper in dissipative document holders or wallets. Document wallets and holders are designed for use within ESD Protected Areas in accordance with EN 61340-5-1. They are static dissipative which means charges are removed to ground when placed on a grounded working surface or handled by a grounded operator. Ring Binders and clipboards are designed to replace high charging insulative regular binders for use within ESD protected areas. They come in different widths with different ring sizes and various rings. Just like document holders/wallets they are static dissipative so charges are removed to ground when placed on a grounded working surface or handled by a grounded operator. Generally conductive, any electrostatic charges on letter trays are removed to ground when the tray is placed on a grounded working surface or touched by a grounded operator. They do not require separate grounding when laid on a grounded surface. We all love our cup of tea or coffee in the morning and most of us have water bottles on stand-by throughout the day. But do you know how much charge a foam or plastic cup generates? Well, let’s just say it’s enough to damage your precious sensitive components! The answer: ESD safe drinking cups and water bottles. There aren’t too many options out there so make sure you do your research before purchasing. ESD safe water bottles are generally dissipative so charges are removed when placed on a grounded surface or handled by a grounded operator. One option for a drinking cup (for hot drinks) is the MENDA insulated drinking cup. It is low charging and the stainless steel portion is grounded when picked up by a grounded operator or when placed on a grounded ESD working surface. Stay tuned for our follow-up post. The below table outlines a sample verification plan using ESD flooring for demonstration purposes. If anything unusual is observed, inform ESD coordinator to take action. Do not clean the floor surface. Use one 2.2 kg electrode, place in the heaviest traffic portion of the floor. Connect the black sensing lead to earth grounding point or common ground point. Press button and hold Test Button until measurement is displayed. If exponent is 8 or lower, the ESD floor passes. Record reading on the form linked in #7. Perform a minimum of five tests per contiguous floor surface material or a minimum of five tests per 460m2. Tests should include those ESD flooring areas that are subject to wear or are visibly dirty. audits and record measurements in appropriate column. B. If audit passes, move on to D.
Clean surface with Statguard® Floor Cleaner (stocked in warehouse), re-test and note in FINDINGS. If floor passes, there is a maintenance problem. Note in COMMENTS and inform ESD Co-ordinator for them to adjust the cleaning schedule. If floor still fails, flooring is not to be used. Contact ESD coordinator immediately so they can initiate a corrective action report. Deal of the Week – We do CUSTOM Bags!